Jets QB Sam Darnold discussed what went wrong against the Patriots in New England and reflected on his rookie season in the NFL. Jets HC Todd Bowles reflected on a tough loss to the Patriots in New England and what the future may hold for him. Jets HC Todd Bowles joined the Michael Kay Show on 98.7 ESPN to reflect on what went wrong in the loss to the Packers on Sunday afternoon. Jets QB Sam Darnold reflected on a tough loss to the Green Bay Packers. Jets HC Todd Bowles had some harsh words for the officiating crew after his team's loss to the Green Bay Packers. Jets DE Henry Anderson reflected on his three sacks against the Houston Texans. Jets DL Leonard Williams discussed a difficult loss to the Texans at home and explained why this team won't be rolling over this season for anyone. Jets QB Sam Darnold reflected on the highs of a strong game personally as well as the lows of a tough loss at home against the Houston Texans. Jets HC Todd Bowles reacted to one of the best games of Sam Darnold's young career as well as a tough loss to the Houston Texans. Jets LB Jordan Jenkins reflected on a much-needed win in Buffalo and took us through the moment that sent him to the sideline to be evaluated for an injury. Jets QB Sam Darnold discussed the injury he sustained in Buffalo and the key moments in the team's comeback win against the Bills. Jets HC Todd Bowles reflected on a thrilling comeback win for his team against the Bills to snap a six-game losing streak. Jets QB Josh McCown reflected on what went wrong for the offense in the red zone and what the team needs to improve on moving forward. Jets HC Todd Bowles had some strong words for his team regarding their lack of execution in a devastating loss to the Titans in Tennessee. Todd Bowles talks with the guys about the Jets loss to New England, if Davis Webb could get a chance to start, Darrelle Revis' criticism and more. Jets DT Steve McLendon says guys are working real hard and they just need to execute the game plans better. Jets WR Quincy Enunwa talked about the squad's improved effort against New England and what the team still has left to play for in 2018. Jets QB Josh McCown discussed what went wrong for the offense in a loss at home against the Patriots. Jets HC Todd Bowles reflected on a tough loss to the Patriots and discussed why he believes his team will continue to fight. Jets CB Mo Claiborne says the effort of players is not a reflection on the coach but their own professionalism. Jets CB Morris Claiborne reflected on a lopsided loss to the Bills and spilled some emotion on what the team needs to do to avoid this outcome again. Jets QB Josh McCown reflected on his first start of the season and what the team can do to improve in the bye week. Jets HC Todd Bowles reacted to a blowout loss at the hand of the Bills and discussed his job security moving forward. Jets QB Sam Darnold recapped what went wrong on a tough day for the offense in the Windy City. Jets HC Todd Bowles reflected on a disappointing loss to the Bears and discussed the impact that injuries have had on their roster. Jets rookie TE Chris Herndon reflected on scoring his second touchdown of the season in a loss to the Vikings. Jets QB Sam Darnold spoke about what went wrong on offense in a tough defeat to the Minnesota Vikings. Jets HC Todd Bowles reacted to a tough day for the team's offense in a turnover-filled loss to the Minnesota Vikings. Todd Bowles talks with the guys about Sam Darnold's continuing development, his conversation with Joe Namath and breaking down his sons' game film. Jets kicker Jason Myers reflects on making seven FGs on his way to the most prolific day in Gang Green kicking history. Jets QB Sam Darnold reflects on what made the offense so successful in a big win over the Indianapolis Colts. Jets HC Todd Bowles discusses the importance of getting back to .500 with a win over the Colts. Jets HC Todd Bowles joins the guys to discuss the team's win vs. the Broncos, QB Sam Darnold's performance, Isaiah Crowell's endorsement deal and more. Jets DL Leonard Williams discussed how the defense was able to fluster Broncos QB Case Keenum and how important that was for the Jets in their victory. Jets QB Sam Darnold reflected on his first home win and discussed what clicked for the offense in their victory over the Broncos. Jets HC Todd Bowles reflected on a much-needed victory for his team and a dominant ground game led by Isaiah Crowell. Jets WR Quincy Enunwa says they didn't execute enough yesterday when they had opportunities. Jets DL Nathan Shepherd reflects on a difficult loss to the Jaguars and what the team can improve in the week leading up to next week's game vs. Denver. Jets QB Sam Darnold discusses what the team's offense needs to do to get back on track after a loss in Jacksonville. Jets HC Todd Bowles admitts that his team took a step backwards in a loss to the Jaguars. Jets DT Steve McLendon says they are all responsible for being more disciplined. Jets QB Sam Darnold explains what he can learn from a frustrating loss to the Browns. Jets HC Todd Bowles reacts to a tough loss in Cleveland and where it all went wrong. Plus, Bowles discusses the QB Sam Darnold's struggles. Jets CB Trumaine Johnson says the Dolphins did a great job controlling the clock on them yesterday. Jets linebacker Jordan Jenkins discusses a tough home loss to the Dolphins and what the team will work on leading up to Thursday's game against Cleveland. Jets quarterback Sam Darnold discusses what went wrong in his home debut and what he can correct before the upcoming Thursday game vs. the Browns. Jets HC Todd Bowles discusses QB Sam Darnold's home debut as well as the costly mistakes his team made in a loss to the Miami. Sam Darnold & Marcus Maye joined Humpty & Canty on 98.7 ESPN to preview the season. Jets LB Darron Lee joined Humpty & Canty and previewed the start of the preseason. Plus, what is the attitude around the team? Jets DT Leonard Williams joined Humpty & Canty on 98.7 ESPN to discuss training camp and if he'll take on more of a leadership role this season. Josh McCown joined Humpty & Canty on 98.7 ESPN to discuss the dynamic of the QB competition. Sam Darnold calls into the show to discuss the Jets QB competition, what it's like in that QB room, how he felt missing the start of camp and more. New York Jets G.M. Mike Maccagnan addressed what the issues were that caused Sam Darnold to miss the start of training camp, and what his expectations for 2018 are. Josh McCown joined the Michael Kay Show on 98.7 ESPN to detail how he intends to attack this upcoming season, which includes mentoring the young quarterbacks on the team. Jermaine Kearse joined the Michael Kay Show on 98.7 ESPN and explained how getting traded to the Jets was ultimately a blessing for his career. Jets safety Jamal Adams joined the Michael Kay Show on 98.7 ESPN to evaluate his rookie campaign and how he could take the next step in Year 2. 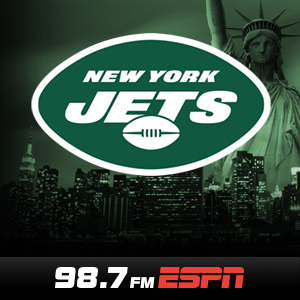 Jets HC Todd Bowles joined the Michael Kay Show on 98.7 ESPN to react to the news of Sam Darnold signing his contract. Plus, an update on the QB competition. Trumaine Johnson joined the Michael Kay Show on 98.7 ESPN to discuss the upcoming season with his new team. What are the expectations? Leonard Williams joined the Michael Kay Show to discuss Sam Darnold officially signing his rookie contract. Plus, is there any pressure on him this year to be a leader? Jets GM Mike Maccagnan says it was an easy decision to make when Sam Darnold was still on the board at 3. Jets GM Mike Maccagnan joins the guys to discuss the Sam Darnold pick, how soon he could see the field and more. Sam Darnold, joins the guys to talk about becoming the Jets' QB of the future. He also explains why his turnover issues in college won't be an issue in the pros. Rex Ryan joins the guys and explains why the Giants made the right move with Saquon Barkley and why he's not a fan of the things that Josh Rosen has had to say thus far. Jets GM Mike Maccagnan says he is looking for a quarterback that can handle all of the pressures of playing in the NFL. Todd Bowles joins for the final time this season to discuss the job he did this year, his contract extension and why anyone would want to be a head coach in the first place. Jets GM Mike Maccagnan joins the guys to look back on the year, discuss their QB situation, Mo Wilkerson's future and more. New York Jets defensive lineman Steve McLendon explained to fans why they should be optimistic about the future of the team. New York Jets quarterback Bryce Petty reflected on what he learned in 2017 and why he was proud to be a member of the Jets. New York Jets head coach Todd Bowles gave his thoughts on the 2017 season and why Bryce Petty was his quarterback down the stretch instead of Christian Hackenberg. The veteran Jets LB looks back on his return season after spending a year in Cleveland and says he'd like to keep playing for head coach Todd Bowles. New York Jets center Jonotthan Harrison describes his afternoon against the Chargers and what the team is still playing for. New York Jets quarterback Bryce Petty discussed a frustrating afternoon against the Chargers and what he needs to improve on moving forward. New York Jets head coach Todd Bowles reflected on another close loss, Mo Wilkerson's status moving forward as well as what he saw from quarterback Bryce Petty. New York Jets head coach Todd Bowles joined Dave Rothenberg, Rick DiPietro and Chris Canty to recap what went wrong in New Orleans and the status of Mo Wilkerson. New York Jets cornerback Buster Skrine knows that his team needs to improve on their play in the fourth quarter, but believes in their roster and the brotherhood behind it. New York Jets quarterback Bryce Petty reflected on his first start of the season and what he needs to improve on going forward. New York Jets head coach Todd Bowles discussed Bryce Petty's performance at quarterback as well as his team's effort against the New Orleans Saints. Jets defensive lineman Leonard Williams joins the guys talking everything from hitting QBs to whether or not he watches football. Jets Head Coach Todd Bowles joins the guys to discuss Josh McCown's unfortunate injury and what the future may hold at that position for Gang Green. Jets quarterback Bryce Petty recaps what went through his mind once he entered the game against the Broncos and what needs to be cleaned up before next week. New York Jets quarterback Josh McCown got very emotional when reflecting on this season and the possibility of not being able to play again in 2017. New York Jets head coach Todd Bowles discussed what went wrong for his team in Denver and the injury status of his starting quarterback, Josh McCown. Jets Head Coach Todd Bowles joins the guys to share his thoughts on the team picking up their 5th win of the season. New York Jets wide receiver Jermaine Kearse recapped his big game against the Kansas City Chiefs. New York Jets quarterback Josh McCown discussed his synergy with Robby Anderson and Jermaine Kearse as well as the team's postseason hopes. New York Jets head coach Todd Bowles reflected on his team finally being able to close out a win in the fourth quarter to remain in the playoff hunt. Todd Bowles talks with the guys about the team's struggles in the 4th quarter. Plus, Coach weighs in on Robby Anderson's Pro Bowl plea. New York Jets quarterback Josh McCown knows that the team has to limit their mistakes moving forward in order to close out tight games. New York Jets running back Matt Forte discussed how the team can learn to close out games in the future. New York Jets head coach Todd Bowles admits that his team made too many mistakes to beat Cam Newton and the Carolina Panthers. Muhammad Wilkerson joins the guys to discuss the retirement of his high school jersey, what Coach Bowles is like behind the scenes and how much he puts away on Thanksgiving. Jets HC Todd Bowles discusses New York's win over the Bills, their late game dance breakout and facing Ryan Fitzpatrick this coming week. New York Jets linebacker Darron Lee discussed winning the turnover battle against the Bills and picking up a win to snap a three-game losing streak. Jets quarterback Josh McCown talked about trying to earn one win at a time and how much a great ground game helps a quarterback. Jets head coach Todd Bowles weighed in on snapping their three-game losing streak and forcing the Buffalo Bills into so many turnovers. New York Jets wide receiver Jermaine Kearse believes that Gang Green has the tools to win tight games, they just need to focus on the small details. New York Jets quarterback Josh McCown reflected on a difficult loss to the Falcons and discussed what the team needs to do to win close games. New York Jets head coach Todd Bowles discussed a tough loss to the Atlanta Falcons in which Gang Green was doomed by late-game mistakes. Jets QB Josh McCown joins the guys to discuss Kiko Alonso's hit on Joe Flacco, the development of the team's young QBs and more. Todd Bowles joins the guys to talk about what was a really frustrating loss on the road against Miami and what he made of Josh McCown's late interception. Jets wide receiver Jermaine Kearse talked about his team having to learn how to close out games and needing to cut down on penalties. Jets quarterback Josh McCown talked about a close loss down in Miami and what he saw on his late-game interception. Jets head coach Todd Bowles discussed a tough loss to the Dolphins and what his team needs to improve on in the future to win close games. Jets head coach Todd Bowles discusses the controversial call at the goal line that went against his team. Plus, is he able to view Sunday's defeat as a moral victory? Jets tight end Austin Seferian-Jenkins weighed in on the questionable call to overturn his second touchdown of the game against the Patriots. Jets cornerback Morris Claiborne reflected on the momentum-turning Seferian-Jenkins play and the team coming together faster than most people thought they would. Jets quarterback Josh McCown discussed his disappointment in the ruling of the Austin Seferian-Jenkins play and coming up short against the Patriots. Jets head coach Todd Bowles discussed the controversial call to reverse Austin Seferian-Jenkins' second score and acknowledged that his team needed to make a few more plays. Jets coach Todd Bowles joins the guys to talk about the team's win over the Browns and how it feels to be proving so many people wrong. New York Jets cornerback Morris Claiborne had an important interception against the Browns and discussed the team improving their record to 3-2 overall. New York Jets quarterback Josh McCown discussed the team's three-game winning streak and how the offense can be more consistent. New York Jets head coach Todd Bowles reflected on his team improving to 3-2 on the season and looked ahead to an improbable battle for first place next week against the Pats. Jets rookie RB Elijah McGuire reflected on scoring his first career touchdown in the NFL. Jets quarterback Josh McCown knows that it was a team effort to take down the Jaguars for their second win of the season. After knocking off the Jacksonville Jaguars for their second win of the season, Jets head coach Todd Bowles discussed his team's rising confidence. Rookie Jets safety Jamal Adams joins the guys to discuss the team's mindset following a Week 3 win over Miami. Plus, any trash talk with former teammate Leonard Fournette? Austin Seferian-Jenkins returned to the Jets' lineup for the first time in 2017 and reflected on what it was like to have to watch from the sideline. Jets quarterback Josh McCown talked about the improving cohesiveness of the offense and how high their ceiling could be. Jets head coach Todd Bowles discussed his team's ability to block out the naysayers and stay focused on winning games. Defensive lineman Leonard Williams discussed what went wrong for the Jets in Oakland against the Raiders. Jets quarterback Josh McCown acknowledged that while the Jets had a tough time in Oakland, there is still reason to be optimistic about the future. Jets head coach Todd Bowles saw some things he liked from his squad but knows that the mistakes need to be reduced moving forward. Despite losing in Buffalo to begin the season, Jets quarterback Josh McCown knows that there are some positives for Gang Green to build on. After a Week 1 loss in Buffalo to open the 2017 season, head coach Todd Bowles discussed what the Jets need to do in order to bounce back next Sunday. After making his debut with the Jets, Jermaine Kearse reflected on a tough loss for Gang Green. Jets running back Elijah McGuire talked about his performance in the final preseason game and his chances of making the Jets roster. Jets quarterback Josh McCown feels fine after getting the wind knocked out of him and having to leave the game momentarily and says he'll be ready to go for the first game. Jets head coach Todd Bowles discussed his decision to play quarterback Josh McCown in the final preseason game and the tough calls he'll have to make when making final cuts. Jets WR ArDarius Stewart scored twice as Gang Green came up just short against the crosstown Giants. He discussed what he's learned in his first NFL training camp. Jets quarterback Christian Hackenberg got the start in the third preseason game and knows that there are some elements of his game that must be improved. Jets head coach Todd Bowles wasn't ready to name a Week 1 starting quarterback just yet and insisted that he needed to watch the film before making any decisions. Sheldon Richardson evaluated the job done by the Gang Green defense and discussed what must be done in order to improve for the third preseason game. As quarterback Bryce Petty enters his third year in the NFL, he admits to feeling more confident this time around. Jets quarterback Christian Hackenberg discussed a tough outing in the second preseason game and what he believes needs to be done in order to improve. Quarterback Christian Hackenberg discussed what he learned last season and how his confidence has grown as he enters his second year in the NFL. In his first game action as a Jet, quarterback Josh McCown led the only touchdown drive of the game and noted that he has high expectations for this offense. Jets head coach Todd Bowles knows that his quarterbacks have some things to work on, but was happy with what he saw from his signal callers in their first preseason action. Are the Jets tanking in 2017? GM Mike Maccagnan says that's not the focus for this season. Thanks to his experiences at Ohio State, Darron Lee says he doesn't feel pressure to succeed for the Jets, and the next step in his development as a team leader is to just make plays. Christian Hackenberg wants to be the Jets' starting QB and says it's his job to convince Todd Bowles, Mike Maccagnan and Co. that he's the man for the job. Sheldon Richardson discusses how he's matured from his past mistakes and what contributed to his issues with Brandon Marshall last year. Jamal Adams explains why his comments about CTE that drew some controversy last week were just an example of his passion for the game of football. These Jets may be the youngest team he's even been involved with, but head coach Todd Bowles says he's about winning in 2017, not developing for the future. Jets GM Mike Maccagnan joined Alan, Rick and Chris to talk about the three-way race at quarterback and continuing to build the Jets through the draft. Jets WR Quincy Enunwa joined Alan, Rick and Chris and talked about his high expectations for himself in this offense and the team's locker room being closer this year. Jets head coach Todd Bowles joined Alan, Rick and Chris to discuss expectations for his team in 2017, his desire to settle for nothing less than a Super Bowl, and his favorite snacks. Jets quarterback Josh McCown sat down with Alan, Rick and Chris to talk about the first few days of training camp with his new teammates and coaches. Jets guard Brian Winters joined Alan, Rick and Chris to talk about his new extension, his desire to build a winning team with the Jets as well as his concerns about C.T.E. Marcus Maye was the second round pick of the Jets in this year's draft, but he's already looking forward to teaming up with fellow rookie safety Jamal Adams. New York Jets defensive linemen Muhammad Wilkerson and Leonard Williams joined Alan, Rick and Chris to discuss what training camp is like under head coach Todd Bowles. The newest Jets QB Josh McCown joins the guys to discuss his role with the team and to hand out some advice to the young quarterbacks on the roster. NY Jets DE Muhammad Wilkerson says they are staying positive while building a culture for this organization. Jets GM Mike Maccagnan talks about how thrilled they were to see Jamal Adams still available at No. 6. Plus, he gives his thoughts on the full-blown rebuild. Jets' owner Woody Johnson reflected on the NFL Draft and discussed his expectations for the team in 2017. NY Jets GM Mike Maccagnan says the goal has always been to build this team through the draft. Jets GM Mike Maccagnan joins to talk about whether or not he believes NY is headed for a lengthy rebuild. Plus, was the Hackenberg pick a mistake? Following the end of the season, Todd Bowles spoke with the guys about perceived dysfunction on the team, Darrelle Revis' future and more. Jets wide receiver Quincy Enunwa talked about the team's Week 17 victory over the Buffalo Bills. Ryan Fitzpatrick reflected on what could have been his final game in a Jets uniform. After a tough season, Jets head coach Todd Bowles was glad to end the year with a win. Jets coach Todd Bowles says that his players' frustration shows that the care, but they still need to handle it better.